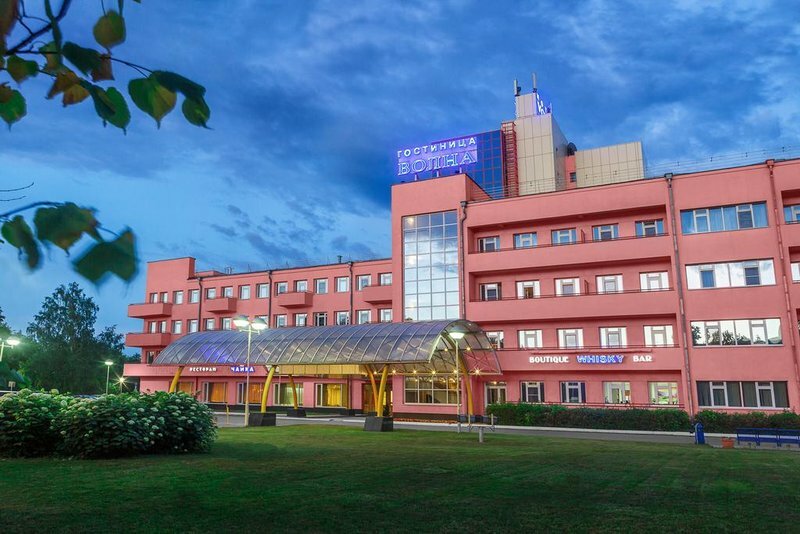 The Volna Hotel is the first and, so far, the only European-class certified four-star hotel in Nizhny Novgorod. The hotel building was constructed in 1936 by V.Orelsky. The old building is a historical monument from the constructivism era of the 1930s. It was deemed to renovate the building while keeping its historical appearance. The new hotel was built and equipped in August 1996. The hotel offers accommodation in 198 comfortable rooms: Single and Twin rooms of the first category, Standard, Business, Diplomat, and Presidential Suites. All rooms feature TV-sets, minibars, direct-dial telephone lines, bathrooms, WCs, hair-dryers, toiletry. Superior rooms offer extra amenities. The hotel has specially equipped rooms for disabled guests and a non-smoking floor. The Chayka restaurant is the only luxury restaurant in Nizhny Novgorod. It offers a creative selection of international and traditional delicacies, accompanied by live music. The Burlak restaurant offers a generous buffet breakfast, organizes catering during banquets, cocktails, presentations, wedding parties and other events. Also at guests' service are the lobby bar and the Boutique Whiskey-bar. The hotel offers possibilities for organization of business functions or family gatherings. Each room is air-conditioned, soundproof and can be set up to different styles of configuration. The necessary equipment in rent is given. The distinguished meeting area has been the choice of major international meeting planners and conference organizers for some of the most successful companies. The Volna Hotel offers a wide range of extra services including business centre, minibus rent, transfer, guarded parking, air and railway ticket offices, 24-hour currency exchange point, express mail, luggage room, safes at reception, newspapers in the hotel lobby, sauna, massage, gym, laundry and dry-cleaning, beauty parlour, solarium, souvenir boutique, taxi service, photo design, billiards, excursions and many others.